The convenience of the cloud has lulled many of us into a sense of complacency when it comes to protecting and preserving our personal data. While backing up data online may protect us from local hard drive crashes, what do you do if the server where your data lives is destroyed? What would you do if your Gmail account suddenly disappeared? You may assume that Google, has redundant backups of your data and can quickly restore information in the unlikely catastrophe. But it’s also important to remember that your information lives on Google’s servers, and living on their servers means you are subject to their Terms of Service. If, for some reason, you should run afoul of what they consider appropriate, you might suddenly find your account suspended or deleted. Fortunately, Google does provide tools you can use to archive your data. 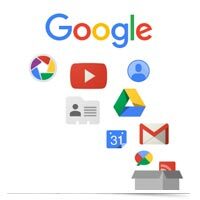 Called “Google Takeout,” the service allows you to “choose the Google products to include in your archive and configure the settings for each product.” After requesting your archive, you are provided with private links to download your data.